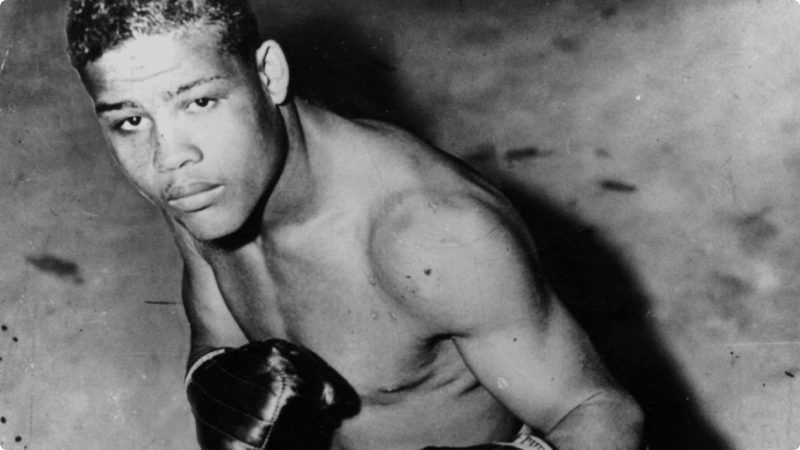 The era of the Brown Bomber, Joe Louis was one of the greatest and most colourful boxers to grace the sport. Only Jack Dempsey since the gloves era got underway compared to him in popularity and ability. This Alabama born boxer who first saw the light of day on May 13th, 1914 and whose father, “Mun” Barrow, was a cotton picker, was a pugilistic symphony with a tempo geared to bring him across the ring with all the grace of a gazelle and the cold fury of an enraged mountain lion. He combined excellent harmony of movement with crushing power stored in each hand. His career will be one that won’t be forgotten in a hurry. The Brown Bomber was a good amateur who turned Professional in 1934. After 12 wins he knocked out Primo Carnera in New York before 62,000 fans and quickly became the hottest property in Boxing. He made a point of beating former world title holders, but Max Schmeling caused of the sport’s biggest upsets when he knocked out Louis in 1936. The Brown Bomber did everything expected of a Champion, he pulverized and paralyzed or poked his way through a larger number of challengers, more than any heavyweight king who wore the Royal Robe before him. He lacked the technique of the masterful Jack Johnson, the powerful offence of James J. Jeffries from a crouching position, the sinking body clouts of Freckled Bob Fitzsimmons, the beautiful ring science of Jim Corbett and the speed of Dempsey in carrying the fight to an opponent. But he combined a good portion of each of them assets of these great ringmen in the addition to a mighty punch to roll up the largest string of successes ever attained by a heavyweight champion. Long before he retired, the Bomber’s place among ring immortals had become a topic of worldwide discussion. Louis brought back to boxing life and colour that was sadly needed, and when he had no more worlds in to conquer he retired. In his rise to fame he faced the good and mediocre, and in his entire career he lost only three contests; his knockout by Schmeling before he became a title holder, and his loss to Ezzard Charles and knockout by Rocky Marciano after he made his comeback attempt. Louis started his professional career following his defeat by Max Marek in the finals of the national amateurs’ championships. Henceforth he was to make a steady rise until he gained the top rung of the ladder. Prior to the knockout he had suffered at the hands of Schmeling, he had won twenty-seven consecutive bouts, all except four by knockouts. Among his victims were many of better class heavyweights, including Stanley Poreda, Charley Massera, Patsy Perroni, Natie Brown, Roy Lazer, Roscoe Toles and Hans Birkie. 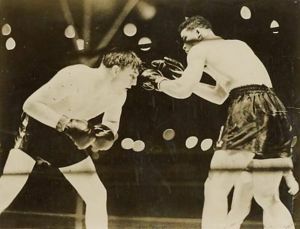 Then those who had launched his professional career – John Roxborough and Julian Black-aided by Mike Jacobs, who promoted all of his major fights after March 28, 1935, when Joe had won the decision over Brown in Detroit, figured that the Bomber was ready for the top men of his division. In successive bouts, Joe knocked out Primo Carnera, in six rounds; King Levinsky in one; Max Baer in four; Paulino Uzcudun in four; and Charley Retzlaff in one. This became the only setback he suffered during his pre-championship and championship day, the knockout by Schmeling. So thorough and masterly a job did the Uhlan perform, that the thousands who had come in expectation of seeing the Brown Bomber put another opponent to sleep because of his supposed invincibility sat dumfounded watching the so-called Executioner executed. Not since the day when the great John L.Sullivan was dethroned by James J Corbett had such a jolt been meted out to the fight public. The “Superman of Boxing” was a pathetic figure as he sat in his corner, first aid administered to him by his trainer Jack Blackburn and his managers after the fatal ten had been counted over him. Face puffed, mouse under his eye, thumbs sprained, he looked nothing like the man who had been mowing down opponent after opponent. When the fight was over, Joe’s mind was set on only one thing-revenge. He quickly decided on plans to prepare himself for a return bout and Mike Jacobs arranged for his comeback with the aim of building him up for a title bout. Jack Sharkey was his first victim, he went out in three rounds. The murderous fists of the Brown Bomber worked beautifully that night, next came Al Ettore of Philadelphia. He lasted through part of the fifth session, Jorge Brescia went out in three, Eddie Simms in one, and Steve Ketchell in two, the start was most satisfactory. Joe’s handlers and Jacobs were delighted with his comeback. Under Mike then matched Joe with Bob Pastor of New York who temporarily halted the steady stream of kayos’ by lasting ten round of what the scribes termed a running match. Bob back-pedalled throughout the ten frames. 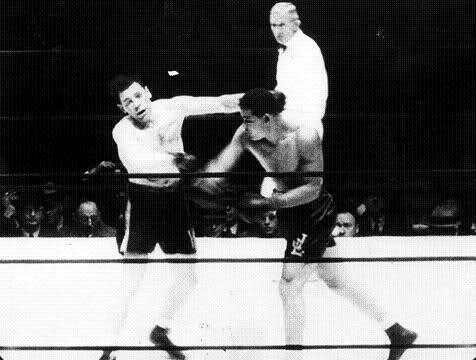 Another knockout of Natie Brown followed, and in the next session, Louis defeated Braddock to win the world crown. The goal of his ambition had been reached but what the most, next to that, was to avenge his knockout by Schmeling. He sought a quick return bout and this he received after he had outpointed Tommy Farr of Wales in an international championship bout. Tommy gave an excellent performance against the Bomber, and those among his countrymen who saw the affair both at the ringside and in the movies were strongly of the opinion that Farr had won. But the majority of the scribes and judges thought otherwise and correctly so, for Louis, despite the aggressiveness of Tommy, tossed leather at a steady gait in the majority of the rounds, His effectiveness was far superior to that of the Welshman. It was stirring bout and an excellent final tune-up for Louis. His triumph over Schmeling followed. He scored the second quickest knockout in the history of the heavyweight championship bouts, 2.04 of the opening round, and in accomplishing this wonderful feat he handed Schmeling a terrible beating. Joe collected $349, 288, 40, an average of $2,832 per second, the record up to that time in any championship fight. The fists of the Bomber crushed his former conqueror in a manner that left no doubt about his superiority. Though Schmeling complained about being struck foul kidney punches, every blow was a fair one. Any that struck Max in the kidneys were because by the twisting of Schmeling’s body as he held on to the upper stand and tried desperately to avoid vicious attack of his opponent. The first two punches, powerful left hook, started Schmeling on his downfall. Once Louis got the range, he kept up a steady bombardment until Max had been halted. The first knockdown followed a right to the chin. The German fell on his shoulder and rolled over twice before coming to a rest with his feet in the air. Louis did most of his attack with his right. Nine such blows landed with accuracy in the first minute. Max was down twice more. The second time, after a count of two, he got to his feet, a powerful right crashed against his jaw and Max went down on all fours. He tried to straighten himself to rise, but while in the process, his chief second, Max Machon tossed in the towel. 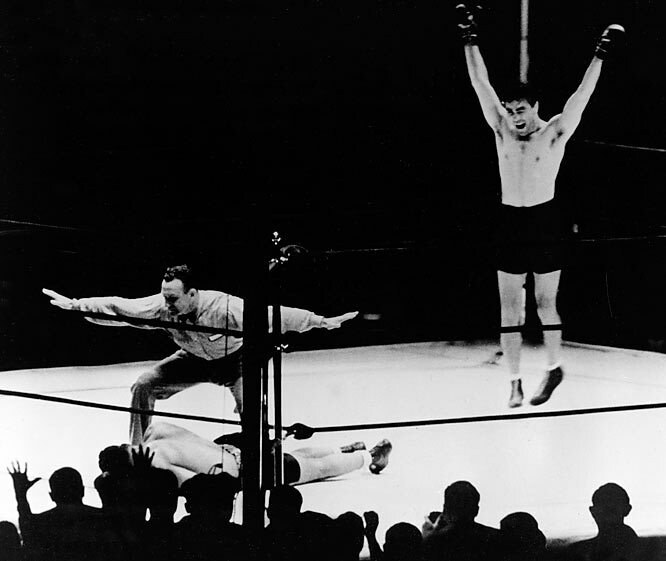 Since this is not permitted under New York rules, Arthur Donovan, the referee, hurled it back, took a good look at Schmeling, and as timekeeper Eddie Joseph had reached eight, Donovan halted the bout. The King had proved his right to the throne. With that great victory, a series of contests was arranged for Louis before his enlistment in the Army, in which he tackled all comers in what became known as the “Bum of the Month” battles. Louis disposed of John Henry Lewis, Jack Roper, Tony Galento, and Bob Pastor in 1939, all by knockouts. Galento floored him but suffered a severe shellacking. Louis started the next year with a discouraging affair with Arturo Gody of Chile, who lasted fifteen rounds as a result of unorthodox tactics, but later Joe got even with him by stopping him in a return engagement after first halting Johnny Paycheck. A kayo over Al McCoy ended that year’s campaign. His biggest successes were registered in 1941 when Red Burman, Gus Dorazio, Abe Simon, Tony Musto, Buddy Bear, Billy Conn and Lou Nova were taken into camp. The Simon bout in Detroit, as well as that with Pastor two years previous was scheduled for twenty rounds but neither went the distance. Simon was knocked out in the thirteenth round and Pastor in the eleventh. The bout with Baer resulted in Buddy’s disqualification when he refused to come out for the seventh round, claiming a foul. He had put Joe through the ropes in the opening round of that mill. Buddy asserted that Joe had struck him after the bell had sounded ending the sixth round. Joe’s victory over Baer marked the champion’s sixth outing in as many months. It had been a busy and wearying campaign of continuous training and fighting, but Louis wasn’t prepared as yet to call it quits. He wanted to keep going. 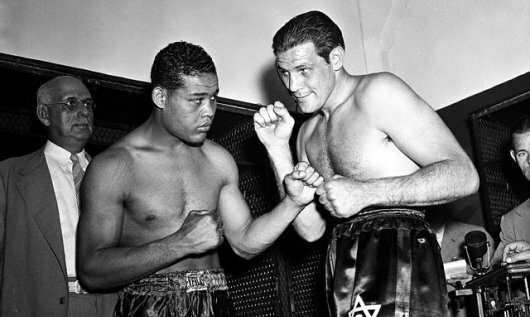 Billy Conn, a brilliant light heavyweight champion, had been clamouring for a crack at Louis. 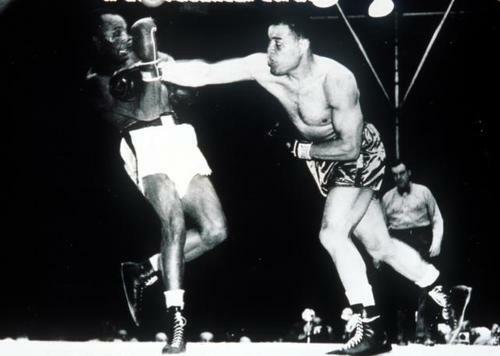 Billy, a flashy boxer, had been enjoying consistent success against the bigger fellows, and a thirteen round kayo of Bob Pastor had convinced him of his ability to cope with Louis. Louis wanted a June fight, and since Conn shaped up as the only possible opponent in sight, the match was arranged for the Polo Grounds. The battle was to prove one of the most tumultuous of Louis’ career, for Conn, outweighed more than twenty-five pounds and at further disadvantages in height and reach, came within the proverbial eyelash of dethroning Louis. In this contest, the bludgeon was too much for the rapier. For the greater part of thirteen rounds, the beautiful jabbing, clever manoeuvring of Conn gave him the advantage. Then, Billy, cocky, confident he was Louis master, gambled a fortune on a knockout. He elected to trade punches with his heavy hitting rival and with only two seconds more to go before the bell would end the thirteenth frame, he was counted out by referee Eddie Joseph. A finishing right from the Bomber’s TNT fist rang down the curtains on the dazzling shows. The game Pittsburgher was within grasp of the crown yet tossed it away by attempting to outslug Joe at a time when the champion was bewildered title holder and not to steady. From then eleventh through to the finish, Conn had suddenly turned aggressor and handed the champion a sound thrashing, much to the amazement of 54,484 fans who rocked the stands with their enthusiasm. Overconfidence caused Billy’s downfall. They were slugging it out, Billy with a grin on his face and Joe with a look of bewilderment, when Louis landed a powerful left hook to the jaw. He followed that with even a harder right and Conn was in a state of collapse. He had little left after that but courage as Louis battered his body with left and rights until the finishing right hand wallop came with only second more to go. Billy Conn came nearest to defeating Louis. When he was halted by Joe, he was ahead of the cards of two of the officials. Judge Marty Monroe had the tally seven to four for Conn with one round even, Referee Eddie Joseph, seven to five for Billy. Judge Healy tabbed it six to six. 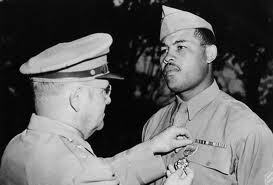 After enlisting in the U.S Army, Louis went overseas on many exhibition tours. Before doing so he fought the return contest with Buddy Baer for the Naval Relief Fund and stopped Buddy in one round. He then tackled Simon in an Army Relief Fund bout and halted him in six. 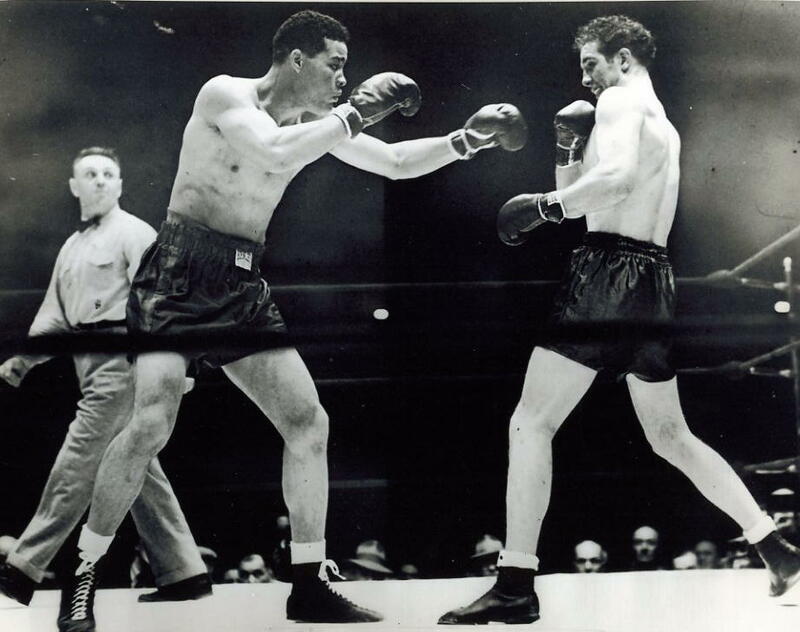 When Louis and Conn were discharged from the Army, Mike Jacobs decided to match them in a repeat fight, figuring the public was ready, now that World War Two had ended, for a big time promotion in boxing. He was correct. With a ringside top of $100 for the first three rows, that bout staged on June 18, 1946, at the Yankees Stadium, drew a paid attendance of $1,925,564, but the affair wasn’t worth more than a $10 tops show. From the standpoint of the fans, it was a flop, with little in it to arouse enthusiasm. It was one of the dullest in Joe’s career, owing entirely to the tactics of Conn, who, fighting an entirely different battle from his first encounter with the Bomber, elected to back step, he took no chances. Of the twenty-three minutes involved, more than three-quarters was packed with dullness and inaction. 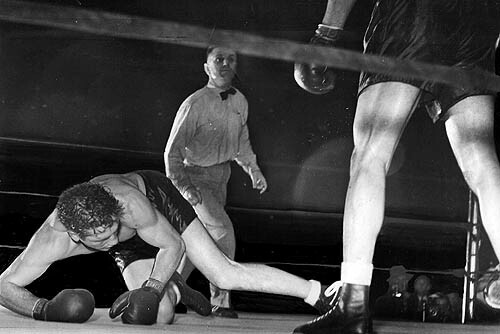 Conn offered the patrons nothing but flying feet and was knocked out in 2.19 of the eighth round. Louis couldn’t catch up with Conn to make the bout interesting and Billy wouldn’t mix it. It was inconceivable that these were the same two who had thrilled a vast gathering only five years before! Up to seven rounds little had been accomplished by either, here and there a weak-hearted jab was tossed. Conn threw nothing that even looked like a punch. Louis tried, but his delivery was ineffective because of the roaming tactics employed by his opponent. 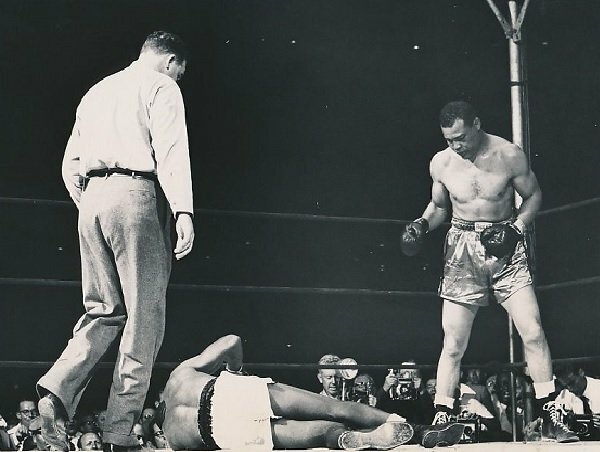 When Conn landed on the canvas he assumed exactly the same posture as did Jack Johnson in Havana-he shaded his eyes from the hot lights, as Johnson did from the sun, while being counted out. The one round knockout of Tami Mauriello followed a bout in which Tami came close to dropping the champion in the first half minute. But Louis, after being hurled almost across the ring with the blow, rushed into his opponent with a vicious attack and it soon was all over. Then a series of exhibitions followed before the Bomber accepted another title defence. This time against he faced the aging Jersey Joe Walcott of Camden, New Jersey. That historic battle in the Madison Square Garden Arena on December 5, 1947, almost saw the termination of Louis long successes. Louis retained his crown because he received a split decision verdict, unpopular with the fans and scribes; Walcott lost his chance to take the crown through his back-pedalling. Never in history of the division has a boxer won a championship running away without attempting a dethronement than he ever had been through in his ten years reign as world champion. He was knocked down twice. The first occurred in the opening round for a count of two and the next in the fourth for a count of seven. The Brown Bomber was battered hard and bleeding. At times he looked foolish as he tried to catch up with his elusive target. His reflexes were bad and his defence was poor, all that was revealed plainly to 18,194 persons who paid $216,477 to see the battle, which was considered so one-sided when it was arranged the odds were 1 to 10. Left jabs and several hooks baffled Louis in the opening round and a solid, short right to the jaw dropped him. The fourth was not a minute old when Walcott crashed his right to the jaw again toppling Louis in his tracks. Not until the ninth round did Louis catch up with his foe. Like a maniac he went after Jersey Joe. Though the blows carried jarring force, Jersey Joe withstood them. From then on Walcott missed many roundhouse rights and kept racing madly away from Louis, only occasionally halting momentarily to toss effective jabs to the head. It was the sprinting tactics of Jersey Joe which cost him the fight. 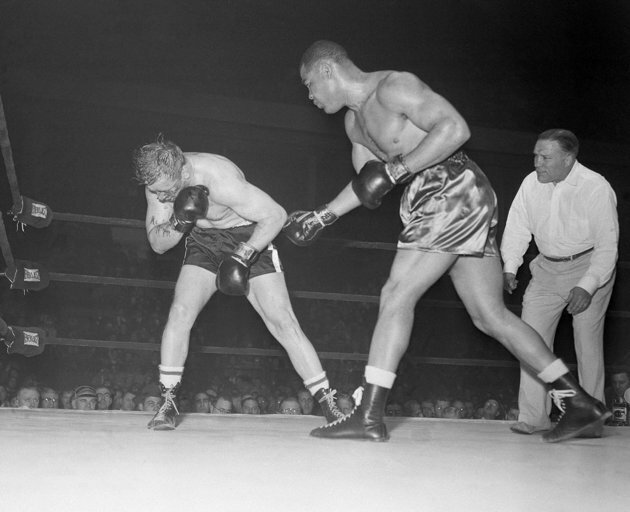 Referee Ruby Goldstein saw the challenger the victor, crediting Walcott with seven rounds to six with two even. Marty Monroe, one of the judges, gave the decision to Louis, none to six, and Judge Frank Forbes called Louis the winner, eight to six and one even. 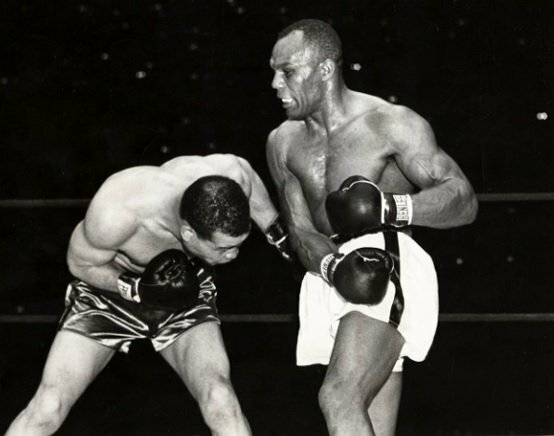 In a return bout six months later, June 25, 1948, at the Yankees Stadium, 42,657 persons saw Louis decisively whip his tormentor by knocking Walcott out in the eleventh round. It was Joe’s twenty-fifth and last title defence. Louis came back a long way to overcome crafty antagonist who had baffled him for ten rounds, then crumbled to the canvas when the Bomber caught up with him. Two minutes of the eleventh round had slipped away in a contest that had been quite tame and had drawn the boos of the crowd. Louis kept pressing, Walcott kept slipping aside, but the champion was in no mood to go through a repetition of their first encounter. Walcott was leading during the first two minutes of the round when his antagonist suddenly attacked with fury. Lefts and rights landed on Walcott’s head, but he made the error of coming off the ropers to swap blows with the Bomber. Jersey Joe thought he had the fight cinched and there’s where he erred. Louis nailed him with a right after three beautiful straight lefts to head and face had numbed Walcott’s brain. His legs were now rubbery. A right to the body and he dropped his guard. As he began to sag, a fast and furious barrage followed. Louis went after the kill, backed his man against the ropes, pounded away with both fists and while Louis set himself for the knockout punch, Nature beat him to it, Walcott collapsed, rolled over on his back, struggled to his knees, and began to crawl as the eight and nine counts were recorded by referee Frank Fullam. Jersey Joe was still down when the fatal ten was reached. 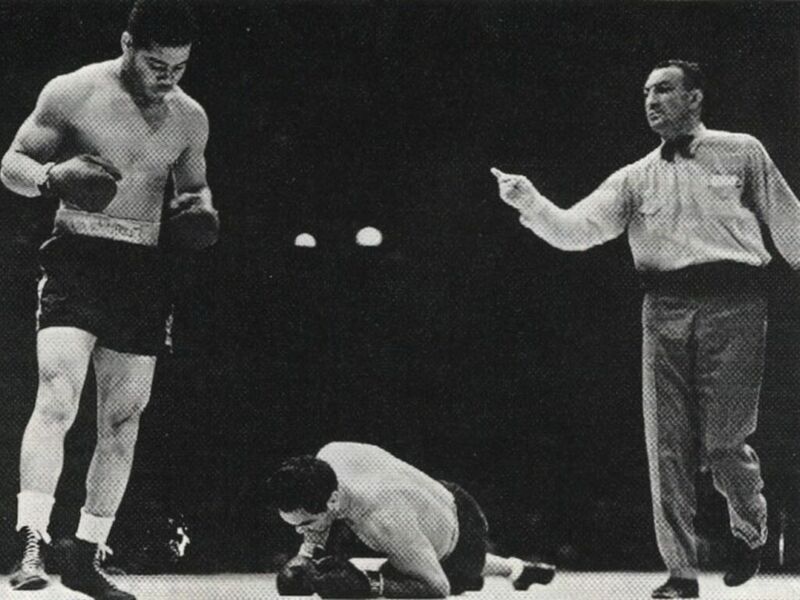 With that victory, Joe Louis made up his mind to quit. He went on another long exhibitions tour and on March 1, 1949, he announced his retirement. Louis requested that Ezzard Charles of Cincinnati, and Walcott who hailed from Camden, New Jersey, fight for the right to succeed him, since they were the outstanding heavyweight contenders. 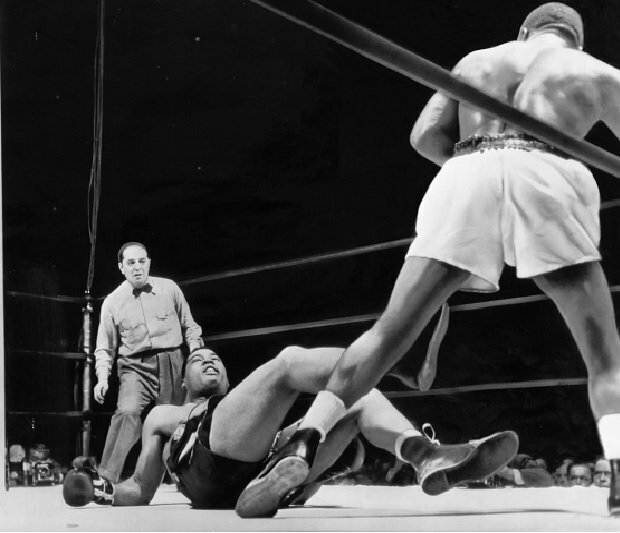 In a contest in Chicago on June 22, 1949, Charles was returned the winner over his Jersey opponent in fifteen rounds. The National Boxing Association accepted this as a world title match, but neither the European Confederations nor the New York Commission acknowledged Charles as the new champion. To prove his right to the crown, he stopped Gus Lesnevich, former light heavyweight king and Pat Valentino of California, each in eight rounds. Then he added New York to his supporters by stopping Freddie Beshore in Buffalo in fourteen rounds. Unlike Jack Dempsey, with whom Louis had been frequently been compared, the Brown Bomber had a vulnerable chin. He couldn’t take it as the Manassa Mauler could, that was evidence but the number of times Louis was dropped to the canvas. 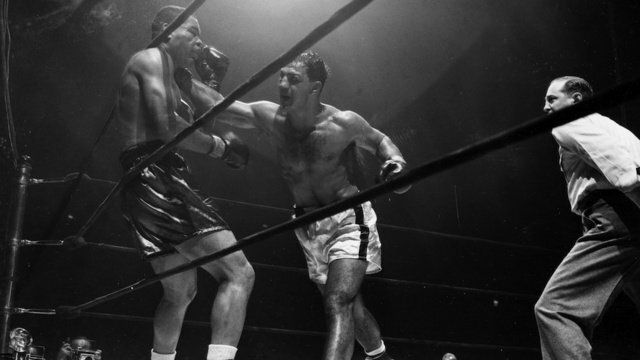 In addition to being floored by Jersey Joe Walcott, he was put down by Buddy Baer, Tony Galento, and Jimmy Braddock in championship contests, and by Max Schmeling twice before, and by Rocky Marciano after returning as champion. He grossed $4,626,721.69 during his fighting career, yet following his retirement he owed more than a million dollars in taxes to the U.S Government due to the loss of his fortune in poor investments and high living. Louis was not the last of the champs in a million-dollar gate promotion. Louis’ friends were now clamouring for him to return to the ring and attempt to regain the throne he had abdicated. He challenged Charles. The champ accepted and further clinched his claim to world laurels. He gained universal recognition as Joe’s successor when he easily outpointed the Brown Bomber in fifteen rounds at the Yankee Stadium. When Joe Louis tried a comeback in 1951, he felt confident that he could put Rocky Marciano away as he had done so often with other opponents. Rocky surprised him by landing a haymaker in the eighth round. 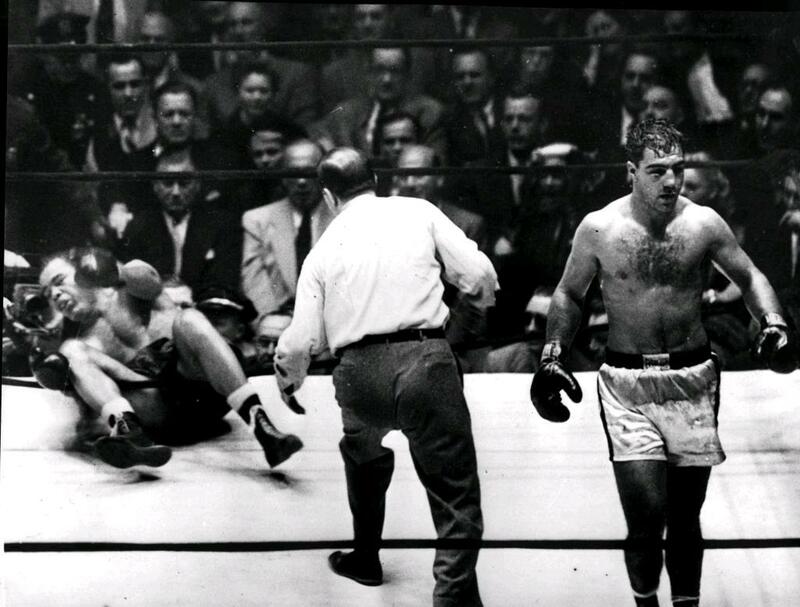 This bout set Marciano up for a title and was the end of the trail for the Brown Bomber. 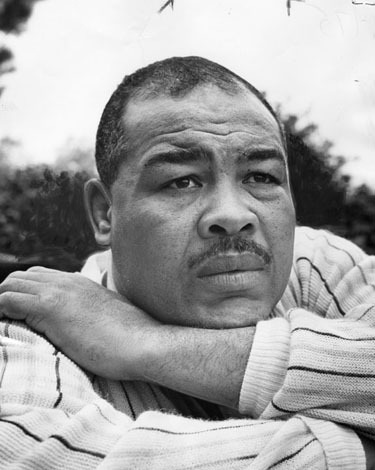 In all, Louis made 25 defences of his Heavyweight title from 1937 to 1948, and was a world champion for 11 years and 10 months. Both are still records in the heavyweight division, the former in any division. His most remarkable record is that he knocked out 23 opponents in 27 title fights, including 5 world champions. 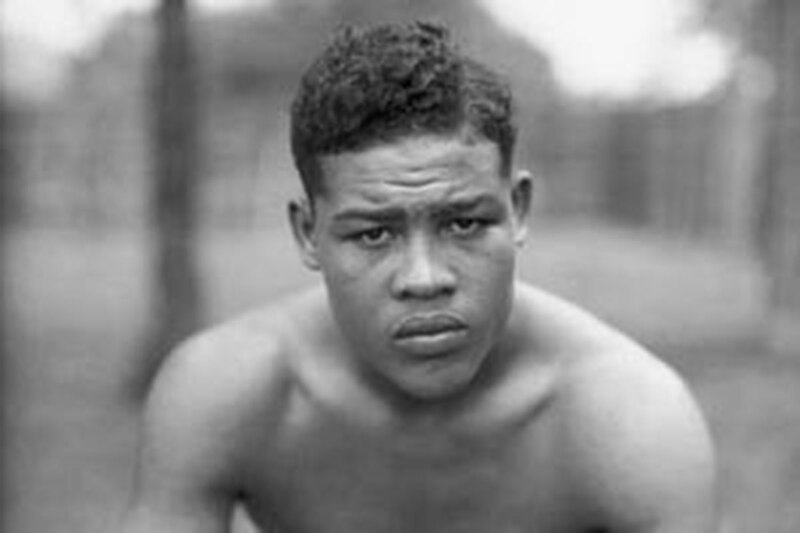 Joe Louis was the first black heavyweight champion, after Jack Johnson, whose victories caused riots. His demeanour was of great importance to him and was so exemplary that he became immensely popular with black and white supporters alike. Sadly, his financial problems were not eased and he was forced to use his name first by wrestling and then as a host in a Vegas casino. Drugs took a toll on Louis in his later years. In 1969, he was hospitalized after collapsing on a New York City street. While the incident was at first credited to “physical breakdown,” underlying problems would soon surface. In 1970, he spent five months at the Colorado Psychiatric Hospital and the Veterans Administration Hospital in Denver, hospitalized by his wife, Martha, and his son, Joe Louis Barrow Jr., for paranoia. In a 1971 book, Brown Bomber, by Barney Nagler, Louis disclosed the truth about these incidents, stating that his collapse in 1969 had been caused by cocaine, and that his subsequent hospitalization had been prompted by his fear of a plot to destroy him. Strokes and heart ailments caused Louis’s condition to deteriorate further later in the decade. He had surgery to correct an aortic aneurysm in 1977 and thereafter used a scooter for a mobility aid. 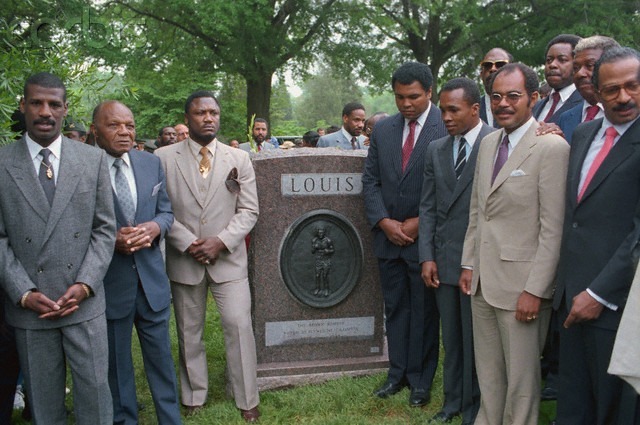 Louis died of cardiac arrest in Desert Springs Hospital near Las Vegas on April 12, 1981, just hours after his last public appearance viewing the Larry Holmes-Trevor Berbick Heavyweight Championship. Ronald Reagan waived the eligibility rules for burial at Arlington National Cemetery and Louis was buried there with full military honours on April 21, 1981. His funeral was paid for in part by former competitor and friend, Max Schmeling, who also acted as a pallbearer. My Dad is in this picture…..God rest his soul. He loved working with these guys. He was The Boxing Commissioner in DC.